Now that both acts of Broken Age have been released, played and reviewed, it's time to see how the game works as a whole. I'll also take into account the scores from each Act for each category. Broken Age has you playing the role of not one, but two characters from two seemingly different worlds (a bit like The Longest Journey in that regard). Of course, the whole point of the game is to find out how these two worlds are connected and how are the two characters you play related. One story is the story of a girl named Vella who lives in a fantasy world terrorised by a giant beast called Mog Chothra. Every year Mog Chothra attends a "Maidens Feast" where he feasts on maidens offered by numerous villages (no it's not a feast in honour of the maidens as you would initially think). In return, it's assumed that Mog Chothra will leave the village alone until next year. Vella is one of these maidens but she has other plans. The other story is about a boy named Shay who is living a Groundhog Day existence on a spaceship where life is monotonous and there is no way he can truly take any risks of make real decisions of his own. In reality it's both feelings that characters share, this sense of futility and lack of free will. Their paths in life seem already written for them but they both believe they're destined for something greater (which is the plot for every fantasy story ever written just about). This game is a point 'n' click adventure and (for once) is not ashamed to be it. No pandering to the console market and their weird controllers - this game is made for the mouse, and the mouse only. A point 'n' click adventure wouldn't be complete without puzzles and there are a variety of puzzles to solve in this game which I think strike the right balance of difficulty (i.e. reasonably easy for veterans but logical enough that newbies can eventually figure it out). In Act 1 you were given the option to switch between characters but I found it rather pointless (and it turned out I was right). However, Double Fine does a big trolololol on you in Act 2 since there's actually a point to switching the characters otherwise you won't be able to solve particular puzzles. The reason why you need to switch characters in Act 2 is a bit convoluted and breaks the fourth wall but at least there's a point to switching between them I suppose! Act 2 was a bit more challenging in terms of gameplay than Act 1, I even had to look up a walkthrough once despite the answer staring at me in the face (I knew what I had to do I just couldn't see where on the screen the vital information was)! "...Double Fine does a big trolololol on you in Act 2 since there's actually a point to switching the characters otherwise you won't be able to solve particular puzzles." This game has top quality voice acting including a mix of professional voice actors and screen actors such as Elijah Wood, Wil Wheaton and Jack Black. I find the music in the game to be fantastic but you'd expect no less from Lucasarts veteran composer, Peter McConnell. Not only that but the Melbourne Symphony Orchestra performed the music! Makes you proud to be an Aussie doesn't it? I love the 2D painted art style. I'm seeing it more and more in the recent resurgence of adventure games and there's something special about this kind of style that can never be replicated using 3D. When Act 1 was originally released there were no Steam Achievements for the game. This has since been rectified so now there's a reason to replay the game, although most achievements should be easy to acquire (i.e. the ones related to your story progress). There are a couple in there that depend on you picking the right conversation options straight up though…which I think we need more of from point ‘n' click adventure games. The game is pretty well polished - my only grievance being the inventory being situated in the bottom left corner for some reason. What happens if you want to try move to the bottom left? You can't. It never really becomes necessary to move there admittedly but why not just have a black bar below that opens up when you hover over it? I mean they already do something similar for the top part of the screen. 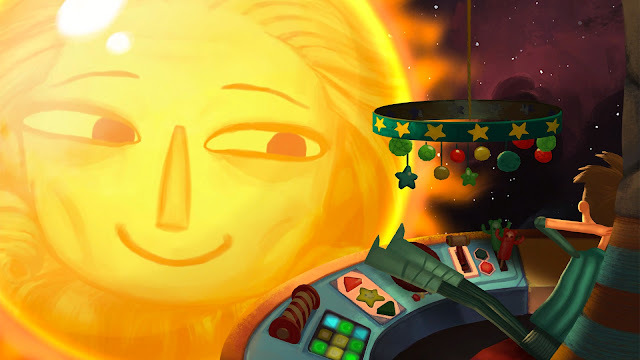 Broken Age is everything you'd expect from Tim Schafer and Double Fine when it comes to adventure games and it's definitely a good example of a point ‘n' click adventure game with high production values. It's just a pity that the second act seems so disjointed from the first though and in an attempt to make puzzles more challenging, results in character development falling by the wayside. The ending isn't that satisfactory either with Schafer's previous adventure game efforts faring better. Is the game worth $24.99 USD? : Yes, this is about the right price for an adventure game with high production values.